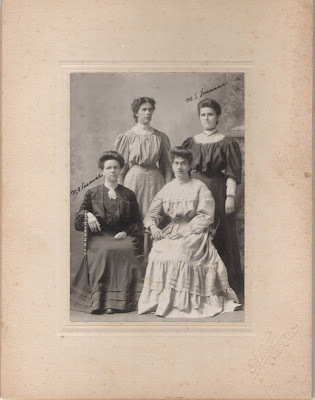 Marie Louise Lacasse and Marie Ann Lacasse with two other young women. The photo is not dated but is probably taken circa 1900. Marie Louise is standing on the right and Marie Ann is sitting on the left. Marie Ann never married and remained at home, perhaps to care for her mother, Marie Louise Mireault, after the death of her father, Didace Lacasse. Marie Louise was thirty five when she married Joseph Paul Emile Rivet, a widower, in Waterford, NY. Thirty five was considered beyond the norm for a first marriage of a woman at that time. Why had she waited? Perhaps she appreciated her financial independence? Marriage was not a blessings for Marie Louise Lacasse. She died four children and eight years later. Three of the children lived to be adults but Marie Louise never knew.